The 2017 Toyota Tacoma TRD Pro is already a favorite among our Santa Ana and Culver City customers, but it’s likely to increase in popularity even more thanks to this recent award by the Texas Auto Writers Association (TAWA). At the TAWA Texas Truck Rodeo held at the start of October, the Tacoma TRD Pro was put to the test against similar competitors and was able to win the Midsize Truck category. Keep reading to learn more about this prestigious award and the reasons behind the big win for the 2017 Toyota Tacoma TRD Pro. More than 70 journalists came out to the two-day TAWA Truck Rodeo where 82 vehicles were evaluated on their standard and off-road capabilities. These journalists thoroughly looked at and assessed the pros of cons of each of the vehicles. There were engineers from the competing manufacturers on hand to answer questions from journalists to aid in the evaluation process. At the end of the day, the 2017 Toyota Tacoma TRD Pro stood out from the competing midsize trucks and took home the award. With its top-of-the-line suspension, exhaust enhancements, and off-road technology, it’s no wonder the 2017 Tacoma TRD Pro took top honors in the Midsize Truck category. The Tacoma TRD Pro was able to easily tackle the demanding off-road course at the TAWA Texas Truck Rodeo thanks to its front springs with a 1-inch lift, rear suspension with progressive-rate off-road leaf spring, and its 16-inch TRD black All-Terrain Kevlar®-reinforced tires. It also showed off its prowess with a 3.5L V6 engine capable of commanding up to 278-hp and 265 lb.-ft. of torque. 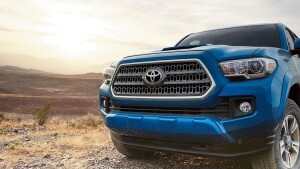 And the Tacoma TRD Pro offers Crawl Control, Multi-Terrain Select, Locking Rear Differential, Hill Start Assist Control, and Active Traction Control systems, which allow drivers to effortlessly navigate over tough terrain. You’ll find the 2017 Toyota Tacoma TRD Pro not only tackles the extreme outdoor with ease, but it also travels faultlessly across the streets of Santa Ana and Culver City. See for yourself when you take it for a test drive at Marina del Rey Toyota today!